I have never been in a city where space is so cherished. Every inch was cleaned. Surfaces were freshly painted, windows polished. And if there was room, and there always seemed to be a little, there would be carefully tended plants. Such a simple display - painted pots and a nice skinny display bench. The only thing to outnumber the bikes were the plants. I adore this informal and charming display of bulbs and spring bloomers. 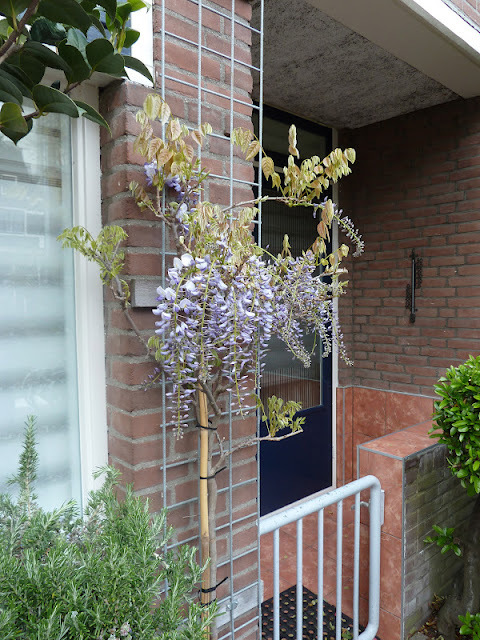 Do you suppose they ask the window washers to trim the Wisteria while they're at it? 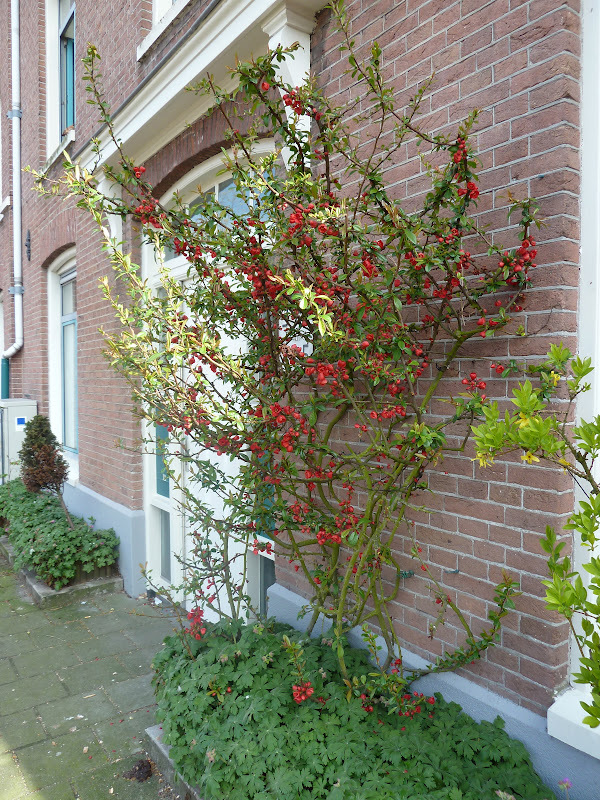 Now quince is something I think of as growing as a bush - this was one of several I saw just hugging the doorway. 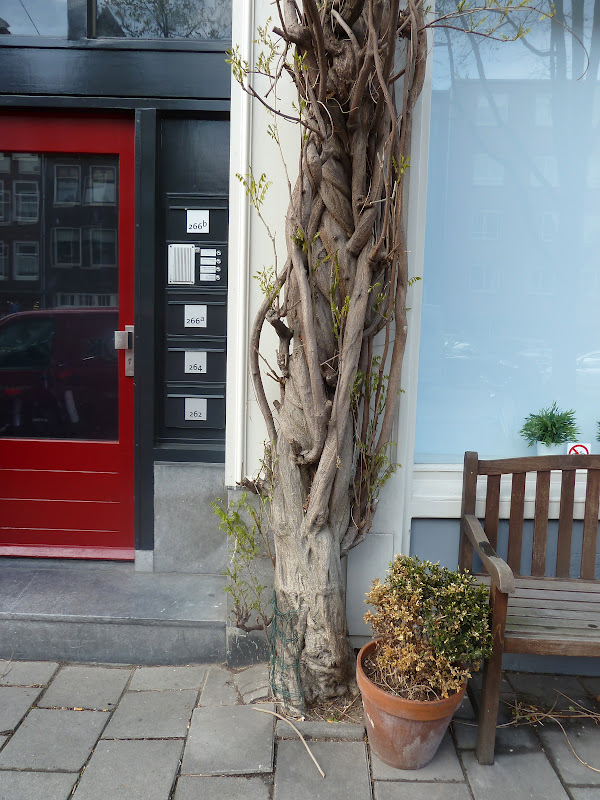 Obviously if you've got a postage stamp of earth, and something to climb, this IS the plant of choice. The cut flowers were equally abundant. Can you imagine 50 stems for 10 Euros? We ate at Season's 3 times. That's our chef across the street taking a break. Look at how the tulips have changed in a matter of days. Have you ever seen tulips with such long stems? I wish more people would consider even a little display of flowers like the one above. Worth mentioning - we were told that painters apprentice and learn for 4 years. The perfect paint job doesn't hurt as a backdrop to this pretty little display. At the botanical garden - these tulips were about the size of the palm of my hand. Again at the botanical gardens - what a lovely spot to have our daily apple pie and coffee. I wonder if I cleaned my windows more frequently, my orchids would look more like this? On the last day in the Netherlands, we took the 15 minute train ride to Haarlem. It's much quieter, though equally lovely. And again, if there was a spot, there was a plant. I saw so many plant friends growing there that I've got in my own garden, I'd almost forgotten just how much milder it is there. You'd have to travel to Vancouver to find one of these in Canada. 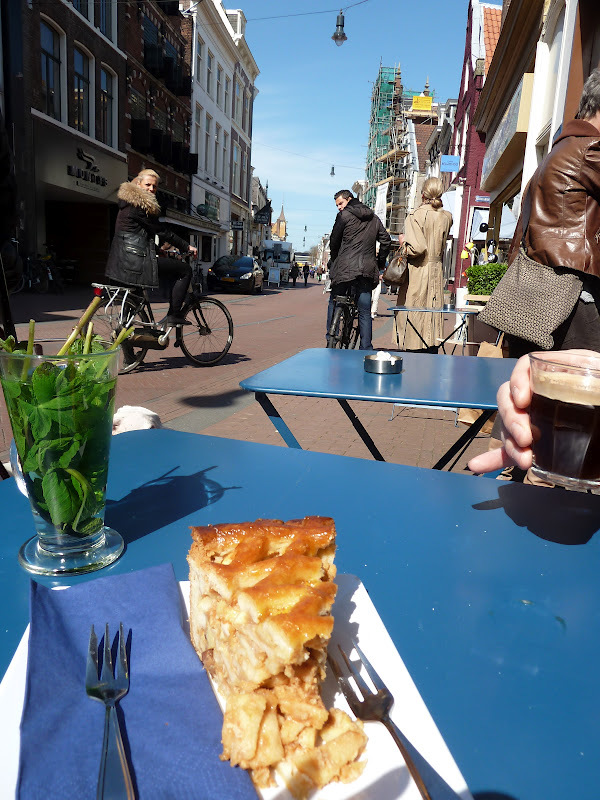 Oh look, more apple pie and coffee in Haarlem too! Although by the afternoon, I'd switched to mint tea. Look how many stems were drowned in order to give me the perfect cup. A splendid way to end our vacation in the Netherlands. Wow, gorgeous photos of a gorgeous place! I had kerria in my garden in BC and I miss it. Fabulous trip!